Before I started any construction, I went looking for reference. Like the latest Space Marines Codex. And then I realized I should just get to work. After seeing the picture in there, I was disappointed. It's going to be lots of work on sub-assemblies and then putting the whole thing together. There is so much detail I need to add to each part that I could never do it once I had the model "assembled." I started with the head. Using a regular "beakie" helmet, I shaved the little sensor off the top. 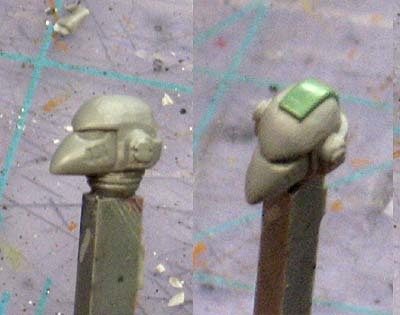 Then I sculpted a vertical helmet vent like the newer helmets have. 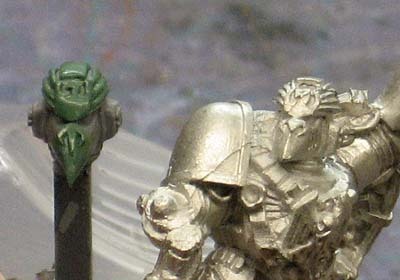 Next was the new nose that is more curved like a hawk's bill and the eagle that is sculpted on top of his helmet. And the finished helmet next to the metal version. I was fortunate that the eagle sculpt came out on the first attempt. It can be difficult working greenstuff on top of greenstuff sometimes. It has a tendency to want to stick more than usual. I realize the pic above shows the new helmet straight on so you can't see the curve to the nosepiece. Between the stages of the head, I worked on the legs. Regular Assault Marine legs were used for this guy. I took the pair I thought would work best and cut the right leg off completely. I trimmed out all the flex-fitting stuff and did some slight trimming to the armour (like removing the right kneepad). Once I had the legs glued back together with a pin at the hip for stability, I started greenstuffing the hip joint back. I had to resculpt part of his hip armour too since I cut part of it away in the beginning. 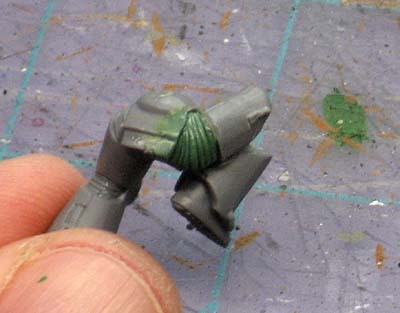 Then it was onto the front and the right knee joint. This is the "fill in" sculpt if you will. I wanted to get as much of it there as I could in one pass and then build up later on as needed. And the final pass. I went back in and added some length to the armour plates and hid a little bit more of the flex fitting. It looked too much like an accordion in the first pass. I also went back in and added the icon to his knee and cleaned up the points on his boots. I'm learning there's a real art to sculpting these icons at such a small scale. It really is a matter of suggestion and letting the viewer fill in the rest with their mind. 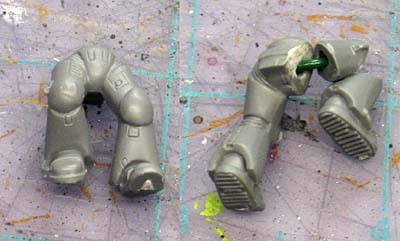 And even though I'm nowhere near ready to begin work on his arms, I started getting the bits ready. 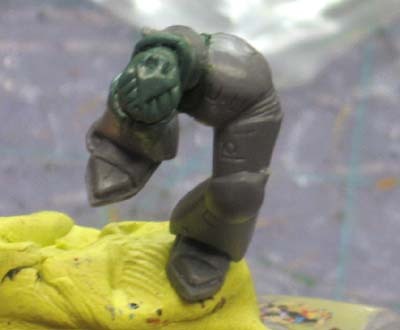 His left arm is from the Commander sprue. 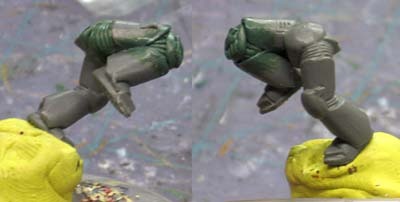 His right arm is one of the Space Wolf lightning claws. I had planned to use the Wolf claws for both arms, but the iconography on the left one was too much to work with so I swapped it out for one of my own bits. The end result is the same, a pair of lightning claws that match. Any reason to not using the assault terminator lightning claws? Asking out of curiosity only:) This whole thing made me a little inspired to make a Captain of the fourth company of the imperial fists. I am painting my assault marines as fourth (green) and thought that a Shrike similie could make for a good Captain. I don't think that I can get quite that level of detail and kustomization you are going for though. And even though it is a WIP it is really starting to take shape and looking like it will turn out great. Will he be painted in "traditional" colors? Makes me wish for a generic HQ kit that can make all HQ variations, including Special Characters. Would encurage people to try out more of them if nothing else. Just bloody awesome. Period. End. Fin. GS-fu is a good way of describing your skills! Great work as usual Ron! Flekkzo: RuntMcRory is right. 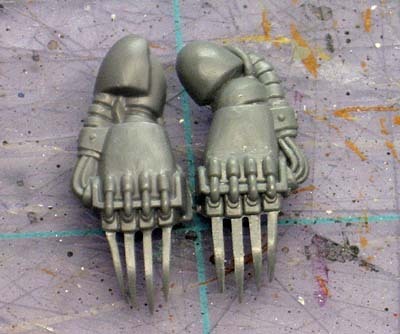 The Termie claws are slightly bigger than their power armoured counterparts. Both would sizes would work I think, each giving a slightly different feel to the model. It depends on what you're trying to do with the conversion. I'm working on his torso today, so expect another update this week. Amazing Ron - can't wait to see this. 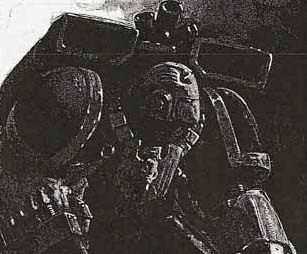 Shrike is without a doubt on of my favorite GW characters. You're work thus far looks sharp. I'm excited about seeing the end result. Keep it coming.